Does anyone know the name of this pattern and where I might find it? Thanks. Looks like a charm pack with 2" sashing and a border. Last edited by auntpiggylpn; 06-28-2013 at 06:35 AM. 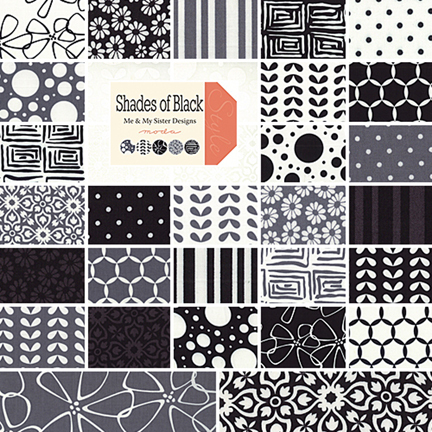 I agree its a charm pack quilt - the fabric looks like a Moda fabric line - I think its called Little Black Dress - I am not sure that's the name but its definitely a Moda line. Yes, it does look like a charm pack with sashing. Why would you need a pattern? You could make it as small or as large as you want. I agree looks like charm pack with sashing. I made a quilt like this out of all blues - It was in a McCalls magazine several years ago. It is an easy quilt to make - I like the quilting on this one. It would be a good one to learn how to quilt on. Thanks everyone. I agree it is most likely just charm squares and am sure I can just do it without pattern. Just wondered if there was one. Checked out the tute and the measurements will help. You could use a layer cake instead of a charm pack and get a larger sized quilt. You probably could fine it on the Moda website. The fabric manufacturers publish the quilt instructions on their web sites in order to motivate you to buy the fabric line. I agree. It's a very easy pattern to adapt to any size. I just finished piecing the center of my charm quilt, but I set it on point. 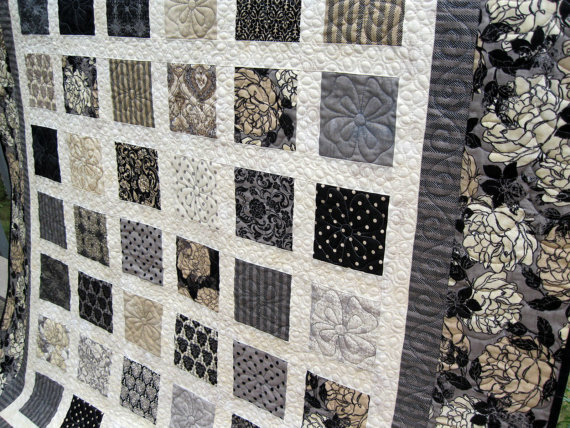 Actually this particular quilt is with "Little Black Dress" fabric but I think that "Shades of Black" would be beautiful also. That is a real nice quilt. Seems to be rather simple but elegant. I have most of the "Little Black Dress" fabrics and am trying to find a pattern that will really show it off. This is the only one so far that I have found that I like. I want the fabrics to be the focus not the pattern. Waiting for a couple pieces of yardage for the borders and then I think I will do this one. Since the fabric is an older one, actually only about a year old, I am having trouble finding some of them. Seems to be very popular. Can't help you with the fabric pattern. I use the same fabric for a graduation quilt but it was in the cross pattern. I LOVE the dp9 patch but have never thought about doing it with the sashing.......maybe that is what I will do with this quilt. Thank you. Yes, thank you. That looks very much like the first one I looked at.